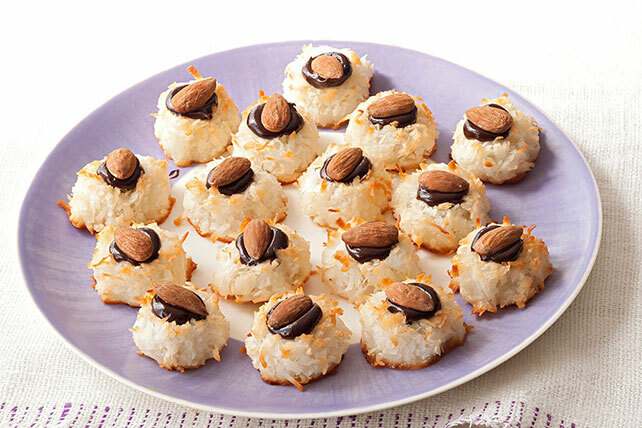 Chocolate and coconut always get on famously, and that holds true once again in these ganache-filled macaroons made with roasted almonds. Combine coconut, sugar and salt in large bowl. Add egg whites and extract; mix well. Drop coconut mixture into 32 mounds on parchment-covered baking sheet, using about 1 Tbsp. coconut mixture for each mound. Press indentation into center of each. Bake 20 min. or until edges are golden brown. Cool completely on baking sheet. Meanwhile, microwave chocolate and COOL WHIP in microwaveable bowl on HIGH 1 min. or until chocolate is completely melted and mixture is well blended, stirring every 30 sec. Cool. Spoon melted chocolate into resealable plastic bag; snip small piece off one bottom corner of bag. Use to fill centers of macaroons; top with nuts.